Dodgers pitching ace Clayton Kershaw made Tuesday night’s game one of the World Series look easy. With 11 strikeouts in a 3-1 win over the Houston Astros, the 2 hour 28 minute was the shortest World Series game in 25 years. The Dodgers began the night on a high when Chris Taylor hit a home-run on the first pitch of the game (only the 4th player in history to do so in a World Series game). It’s only the first game, but according to the stats, 64% of the time, the game 1 winner wins the best of seven series. At 103 degrees, the game was also the hottest game in post-season baseball history. Game 2 is Wednesday night at 8:09 pm ET. Pittsburgh Steelers QB Ben Roethlisberger tore his meniscus in the Steeleer’s loss to the Miami Dolphins. After surgery this week, the Team will have a better idea if/when he’ll be back on the field. Dolphins 30, Steelers 15. Now that New England’s QB Tom Brady is back, the team looks unbeatable. The Patriots were a solid 3-1 while Brady was on suspension, but now the team seems unstoppable. The Cincinnati Bengals kept Sunday’s game close, but Brady kept his cool throwing for 376 yards and 3 touchdowns. Tight end Rob Gronkowski added a career high 162 yards. New England Patriots 35, Cincinnati Bengals 17. Colin Kaepernick started at quarterback for the SF 49ers on Sunday (against the Buffalo Bills) for the first time since November 2015. Bills fans showed their dislike of Kaep by booing him as he walked on the field then chanting “USA, USA” before he knelt (as he’s done all season) for the National Anthem. The Bills were clearly fired up as the team continued their 4 game win streak with a big win over the Niners. Bills 45, Niners 16. After the Carolina Panthers lost another tough game (this week to the New Orleans Saints) Panthers QB Cam Newton had people talking. 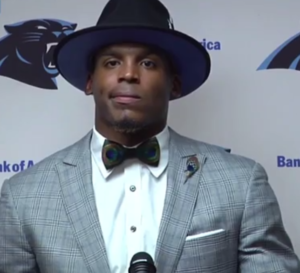 In an uncomfortable to watch press conference after the game, Cam either refused to answer questions or just gave one word responses while staring straight ahead. After a very long and cringe-worthy one minute and 30 seconds, Cam eventually walked out. Saints 41, Panthers 38. It’s a bit shocking Dallas Cowboys coach Jason Garrett is still talking about a quarterback controversy. Rookie and 4th round draft pick, Dak Prescott, has performed like an MVP this season, so it seems odd that anyone is still talking about having Tony Romo take over when he’s healthy. Speaking of rookies, Ezekiel Elliott’s star power has soared amassing over 100 rushing yards in each of his last 4 games.The only other player to have more rushing yards in his first 6 games was Hall of Famer Eric Dickerson in 1983. Dallas 30, Green Bay Packers 16. Clayton Kershaw, pitching 7 scoreless innings, led the LA Dodgers to a win to even the NLCS series against the Chicago Cubs. The Dodgers and Cubs will play game 3 on Tuesday. In the ALCS, the Cleveland Indians have a two game lead over the Toronto Blue Jays. The teams will play Game 3 on Monday night. 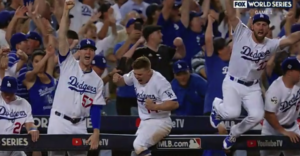 The LA Dodgers pulled out a game 5 win over the Washington Nationals with a strong (and very long 1 hour 6 minute) 7th inning. The Nationals gave up 4 runs late in the 7th then to cap it off, the Dodgers used their Cy Young starting pitcher Clayton Kershaw (who pitched in game 4 and wasn’t expected to be on the mound in this game) to seal the win 4-3. The Dodgers now head to Chicago where they will face the Cubs in game 1 of the National League Championship Series. With a disappointing loss to the 1-4 San Diego Chargers, the Denver Broncos have now lost 2 games in a row. Broncos coach Gary Kubiak didn’t make the game as he’s recovering from a migraine disorder. When he returns he’ll have lots to work on with his team as neither the offense or the defense were performing. This win meant a lot to the Chargers as it not only kept their season alive (and potentially staved off their coaches firing) but also helped morale as the Chargers have lost nine of their last 10 games against the Broncos. Chargers 21, Broncos 13. The Brooklyn Nets hope Jeremy Lin releases his “Linsanity” on the Team next year for a 3 year $36 million contract. Lin admitted his 11 game run (averaging 24 points and 9 assists) while the New York Knicks were considering releasing him was exciting. He now says he doesn’t want to be thought of as a phenomenon. He just wants to contribute to the Nets and help them rebuild. Former Ohio State running back and 4th pick in the draft, Ezekiel Elliott, won’t play in an NFL game until September but his jersey his selling off the shelves. 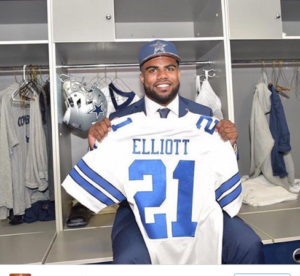 Elliott’s #21 Dallas Cowboys jersey is the best selling item in the league. Former Cleveland Brown QB Johnny Manziel can’t seem to stay out of the news. First there was his odd instagram post announcing he was getting help and would be back soon, then over the weekend in Hawaii, he punched a guest in the face at his friend’s wedding. If he does “come back”, at this rate it looks as if it won’t be on a football field. 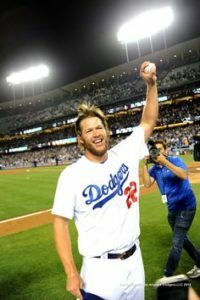 Dave Roberts, the Los Angeles Dodger’s manager, created a panic this week by announcing his star pitcher and many would argue the best pitcher in the League, Clayton Kershaw, was perhaps having a setback in his recovery from a herniated disk. Roberts indicated “surgery is more of a possibility” but didn’t say whether that would be this year or next or down the road at some point. Roberts’ comment has created a huge buzz around the League speculating on whether Kershaw will be out for the season.